In the year 1920 Christopher Robin Milne was born to A.A. Milne and Daphne in Chelsea, West London. Christopher Robin Milne was the inspiration behind Milne's Winnie-the-Pooh' children's story books where Christopher Robin figured prominently along side the other Pooh Characters. Christopher Robin's father A.A. Milne wrote the stories based upon the stuff toys collection Christopher had and in particular a stuff toy bear that Christopher received as a present on his 1st birthday. When he was aged 5, A.A. Milne brought Cotchford Farm in Sussex which is referred to as the Hundred Acre Wood in all A.A. Milne's storybooks. A.A. Milne wrote 4 books containing poetry & stories based on Christopher Robin and his stuffed friends: When We Were Very Young (1924), Winnie-the-Pooh (1926), Now We Are Six (1927), and The House at Pooh Corner (1928). 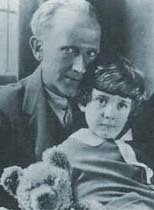 Upon reaching adulthood Christopher Milne wrote many books wherein he reveals his experience as young Christopher Robin. In his 1st book, Enchanted Places, he tells about his so ambivalent relationship with his father and the difficult times he spent at his boarding school. He also mentions the struggle he had to face and how he had to cope-up with Winnie-the-Pooh status. Read more about the History of Winnie the Pooh.